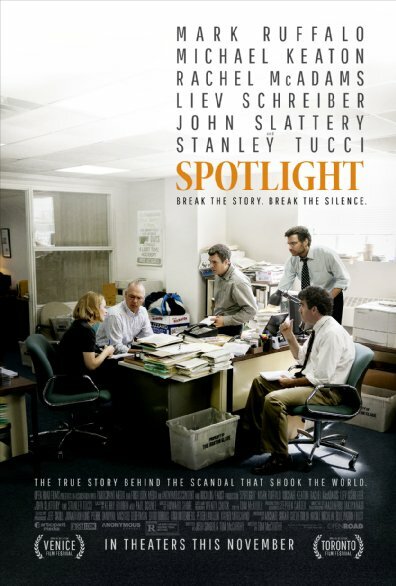 I wouldn’t be shocked if Spotlight, the new film from Thomas McCarthy, ends up being this year’s Best Picture winner. Based on the true story of how a group of Boston Globe reporters discovered sexual abuse within the Catholic Church that had been going on for years, the film has garnered praise from every festival, film organization, the people of Boston, and even the Catholic Church, who have praised the film for its honesty. The film features a terrific ensemble cast of some of the best actors that appear on both the big and small screen these days, with Michael Keaton, Rachel McAdams, Mark Ruffalo and many more apart of this terrific team of actors. I’d go as far to say that Spotlight is hands down the best film of 2015, which is a statement that I’ve been abusing for the past year, but this time I don’t think anybody is gonna knock this film off that mantle. Here’s my review of Spotlight. The film begins in 2001, when the Boston Globe investigative team called Spotlight gets a tip about years and years of cover-ups from the Catholic Church and how they got away with sexually abusing young children for decades. This was a topic that wasn’t as well known as it is nowadays, and the Globe was risking much more that readership with publishing a story such as this. Focus of this story comes after the Globe hires Marty Baron to be the paper’s new editor-in-chief, whose played by Liev Schreiber. The team is under constant scrutiny as they uncover this story, from the Catholic Church, the dozens of lawyers who settled claims on behave of the church, and so on. This film comes after Tom McCarthy’s critically derailed film, The Cobbler, which he made with Adam Sandler last year. While I never saw the film, it was considered a rare misstep from the filmmaker who brought us indie gems such as The Station Agent, The Visitor, and Win Win. The nice thing now is that Tom McCarthy probably doesn’t have to worry about the failure that was The Cobbler since he’s delivered what could now be the Oscar contender to beat, since Steve Jobs bombed so horribly with audience members. There’s so much that Spotlight does wrong that it was damn near impossible to find any wrongs with the film. The performances from the cast was incredible, particularly Keaton and Ruffalo. The screenplay co-written by McCarthy was top-notch, and made things like deadlines, uncovering records, and other mundane items play out in a more thrilling and exciting manner than most big-budgeted action and thrillers from the previous year. It’s also a great callback to great thrillers like All The Presidents Men, in that newspapers and journalists could change the course of history with the stories they published. Another film critic mentioned that what makes this film so unique is that the villain in the film is largely an invisible one, which makes you as an audience member even angrier. The fact that these lawyers are unapologetic in that they covered up the churches dirty work by settling with the victims is pretty remarkable and despicable at the same time. Other than the lawyers, and the Archbishop who was forced to resign in the wake of this story, you never see a true villain in the film, which is brilliant. Some could perceive it being the Catholic Church as a whole, or the examples I had just listed before. And that’s the brilliancy of Spotlight, for that and many other reasons. The easy route would’ve been to antagonize that church as a whole but instead go after the priests who committed these crimes, and the people who helped cover it up. And by doing this, more of these travesty’s were uncovered all around the world, giving victims a voice, which was something that many of them hadn’t had before. I’d be more than happy if Spotlight won every major award from every major association all the way up until the Academy Awards in February. It’s one of the smartest and most important films of the decade, and one that I’d consider to be one of the finest films about journalism. The film is continuing the expand nationwide, and once the film hits your area I highly suggest you go and check this one out.